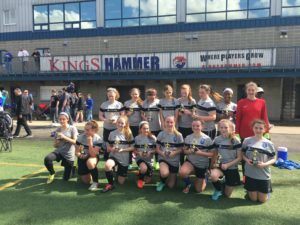 The CSC 2003 Girls were finalists at the 2017 Adidas Turf Classic Tournament the weekend of March 24-26, 2017. The team won the following matches against Ohio Fusion 3-1, Kings Hammer Red 1-0, and NKSA 3-0 advancing them to the finals, where they lost to Kings Hammer Coleman 5-1. Congratulations CSC 2003 Girls and Coach Pete!